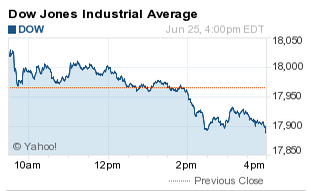 The DJIA today fell 75 points, as investors continue to monitor issues in Greece. The decline would have been greater if healthcare and insurance stocks didn't hold up the markets today. This afternoon, the U.S. Supreme Court ruled in favor of preserving Federal subsidies offered under the Affordable Care Act. Meanwhile, little progress was made in Europe as Greece attempts to complete a last-minute drive to resolve its pending debt obligations to its international creditors. Today, Germany's Chancellor Angela Merkel said a deal must be reached by Monday. The S&P 500 Volatility Index (VIX), the market's fear gauge, jumped more than 5.6% today. The ACA Ruling: Healthcare and insurance stocks surged this afternoon on news that the U.S. Supreme Court upheld federal subsidy payments, guaranteeing revenue streams for Americans who signed up for coverage after the passage of the Affordable Care Act. The Supreme Court ruled 6 to 3 to uphold these subsidies for up to 8 million people. Shares of Tenet Healthcare Corp. (NYSE: THC) gained more than 12%, shares of Universal Health Services Inc. (NYSE: UHS) added 7.7%, and HCA Holdings Inc. (NYSE: HCA) were up more than 8.8%. On Tap Tomorrow: On Friday, investors will continue to monitor the ongoing breakdown of negotiations between debt-riddled Greece and its international creditors. The U.S. economic calendar will provide insight into domestic consumer sentiment, and Finish Line Inc. (Nasdaq: FINL) will report quarterly earnings. Stocks to Watch 1, HUM: While health insurance stocks were already benefiting from the Obamacare ruling, merger and acquisition news continues to drive shares higher. Today, shares of Humana (NYSE: HUM) rose on news that it could be purchased by rival Aetna Inc. (NYSE: AET) by as soon as this weekend. Humana also had received an offer from Cigna Corp. (NYSE: CI), but several sources reported that the firm's board of directors saw a better financial and operational fit with Aetna. The two companies accelerated discussions after rumors emerged that Cigna and Anthem Inc. (NYSE: ANTM) were exploring their own merger. Stocks to Watch No. 3, MCP:S. mining company Molycorp Inc. (NYSE: MCP) announced today that the company and several of its subsidiaries plan to file for Chapter 11 bankruptcy protection. In May 2011, the stock traded at an all-time high in the mid-$70s; however, the producer of rare-earth metals has collapsed during one of the largest commodity busts in recent memory. Stocks to Watch No. 4, CVX: Shares of Chevron Corp. (NYSE: CVX) continued its slide beneath $100 per share as oil prices declined again. Oil traders are keeping an eye on the June 30 deadline for a nuclear agreement between the West and Iran. The deal would lift sanctions on Tehran's oil exports. Brent crude prices slipped 0.7%, while WTI prices fell by 1%. The decline also dragged down shares of multinational rivals Exxon Mobil Corp. (NYSE: XOM) and Royal Dutch Shell Plc. (NYSE ADR: A).